Part 3: Where do NTFF Directors re-charge after the film festival? 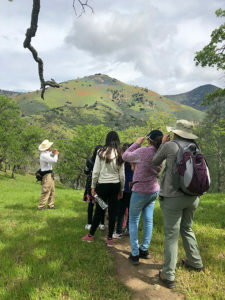 After the NatureTrack Film Festival, the proceeds of which go toward supporting the foundation, Sue resumed pairing knowledgeable volunteer docents with students eagerly hopping off the bus to explore the trails. As the founder of NatureTrack, Sue finds a renewed sense of purpose every time she hears the happy chatter of kids excited about crossing streams for the first time, finding an interesting animal, or really looking at a plant and understanding its place in our ecosystem. And, with the arrival of spring, there were new flowers to discover, lush grasslands to explore, creeks to hop, and budding plants to ponder. A typical field trip begins at the NatureTrack transit van where Sue has gathered a treasure trove of nature books, flora and fauna identity cards, games, activities, journals, magnifying glasses, binoculars, bug boxes with magnifying lids, and more. All available to every docent leading a covey of kids so that the adventure that day will be unique, educational, fun, and memorable. At the beginning of each session on the trail, before the kids arrive, the docents gather to talk about routes to take or share knowledge of interesting features they’ve discovered that might be fun to visit. They divvy into partners: one the lead (always in the front) and one the sweep (always in the back). The teams load up their packs with whatever educational tools they’ve decided to take, snacks for the kids, a first aid kit, and a walkie-talkie - everything needed for a perfect experience out in nature! Then, they go to greet the bus as it arrives - happily sorting kids into the correct groups. Before the hike, the docents get to know the kids they’ll be with. They check to make sure everyone has brought water, lunch, and is well prepared for the day. An important moment is taken to discuss the good habits of a naturalist on the trail and what to expect. Questions are asked and answered with enthusiasm. All are eager to get moving, all are eager to see what they can discover, and all come back several hours later with new stories to share with their families and friends. Who knows? Out of the over 18,000 K-12 school kids who’ve experienced a NatureTrack field trip - one or two could grow up to be a filmmaker screening a movie that “ignites passion for nature” at a NatureTrack Film Festival in the future! ← Part 2: Where do NTFF Directors re-charge after the film festival?